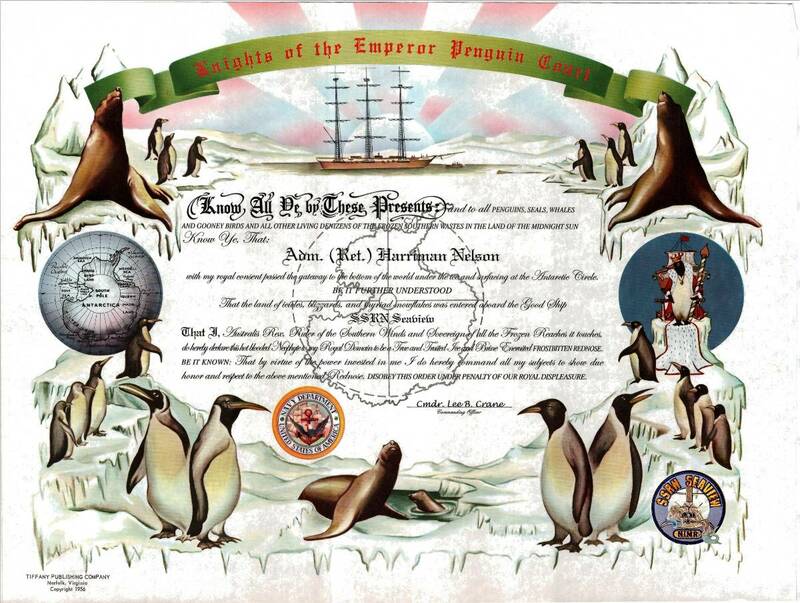 It's a long held maritime tradition that certain events be documented with certificates. Often presented with a ribbon and an embossed seal, (the flat kind you stick on, not the barking furry watery kind), they can range from a humorous to a semi documentary memento of the experience. 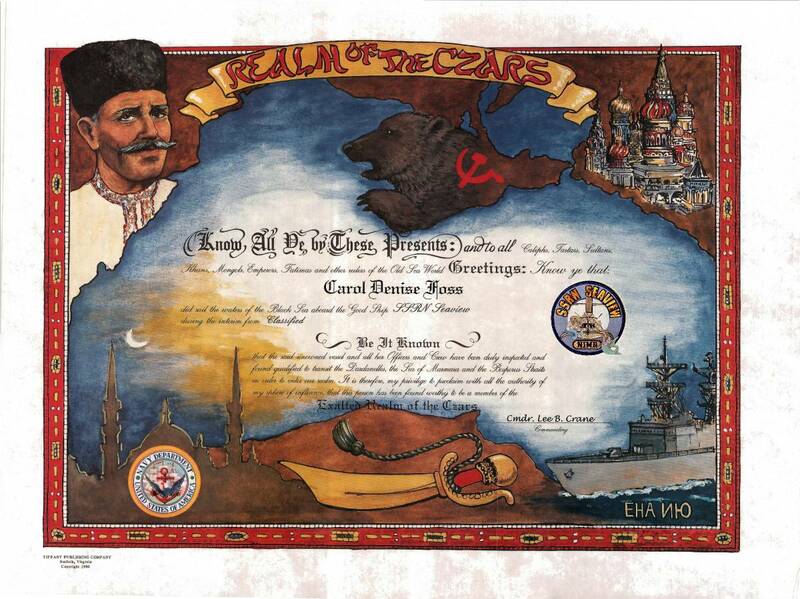 And so here are some certificates from the attic of our beloved memories aboard Seaview. *These parchment renderings are from a wonderful company called Tiffany Publishing which is linked here.Seaview Stories is not an affiliate and recieves no commission for any future purchases by an visitors here. Blue Nose (Crossing of the Arctic Circle 66-32 N. latitude)aka 'Northern Domain of the Polar Bear'. Seaview has certainly seen her share of Blue or Frostbitten Noses here. 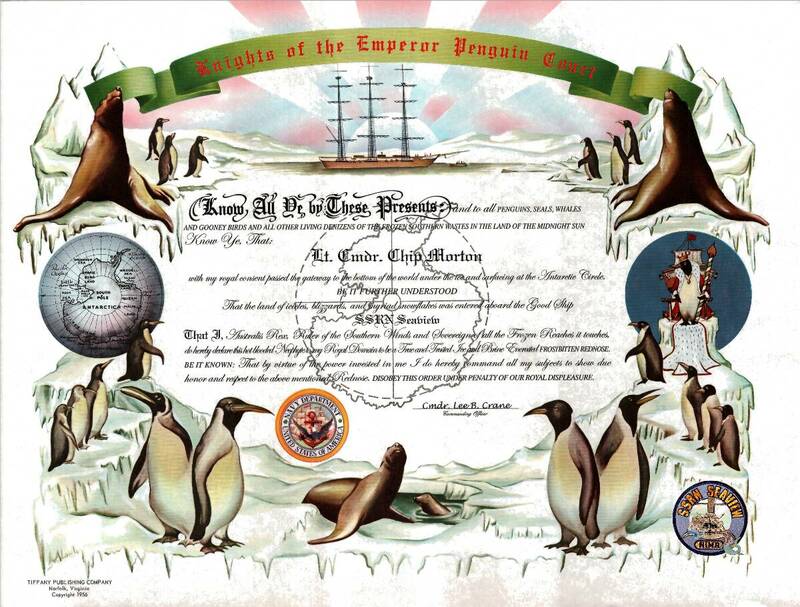 Red Nose (Crossing of the Antarctic Circle 66-32 S. latitute) aka Royal Domain of the Penquin, Frozen Stiff. Seaview has visited on occassion. Caterpillar Club(Making an unscheduled parachute jump from a disabled plane, or in our case the Flying Sub. No certificate that I can find but members are issued a gold caterpillar pin to wear only on civies. The caterpillar has jeweled red eyes. Applies to Capt. Crane, who is also entitled to be in the Goldfish Club for splashing into the water from that unsheduled jump) Some unverified sources also indicate ditching and using a life raft,which can only be easily glossed over with Crane's use of a 'Mae West' life preserver. Since he was picked up rather quickly by that enemy sub, he is NOT entitled to the designation of 'Sea Squatter '. 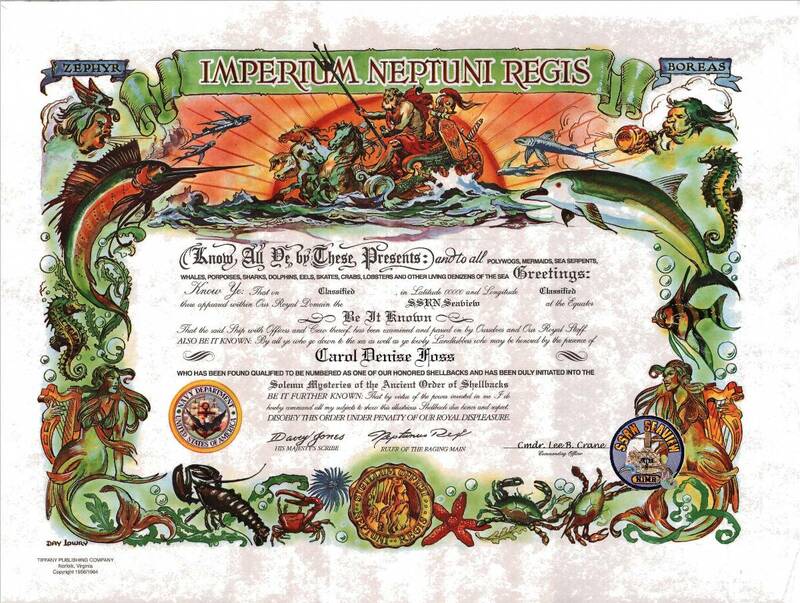 Deep Dive Diploma Diploma issued to those who've been on a dive in a submarine. Issued for 'first' dives, 'last dives', and /or to guests aboard at the time, not to mention all of us. 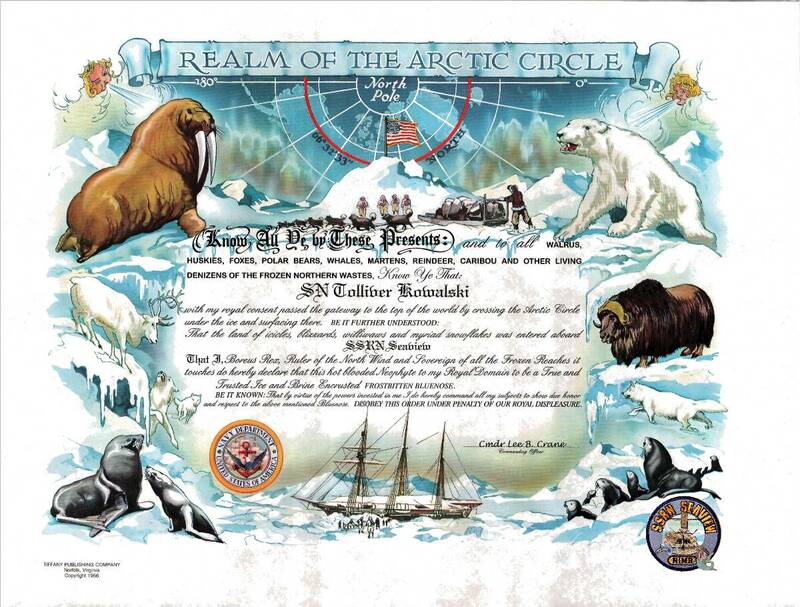 After all, we've been sharing in Seaview's adventures, so we're all as much as entitled to her unofficial certificates as those lucky crewmen and visitors were. ShellbackCrossing the Equator (Crossing the Line), also Golden Shellbaack for crossing the Equator at the International Date Line, and Emerald Shellback for crossing the Equator at the Greenwich Meridian. 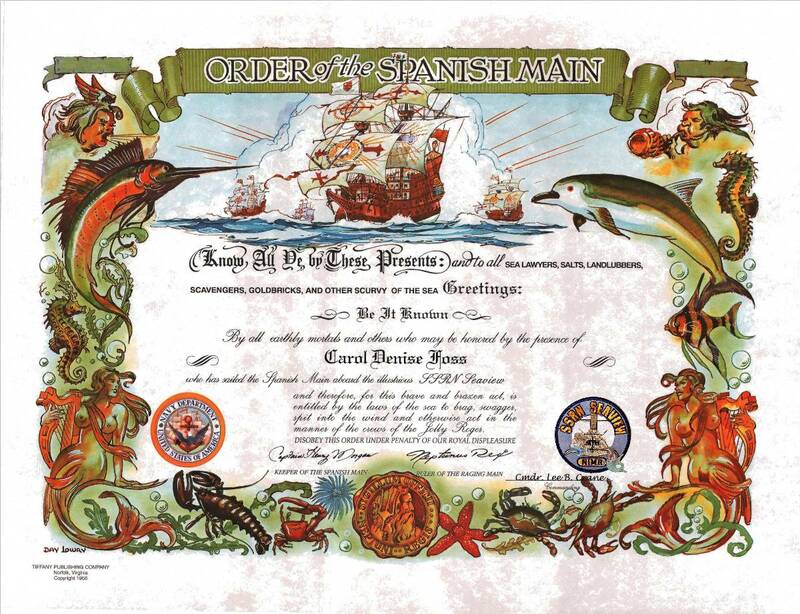 While most of our officers and crew aboard Seaview have these certificates already from prior Navy service, no doubt there were a few who didn't and earned their shellbacks aboard. Golden Dragon Crossing the the 180th Meridian (International Date Line. Mossback Going around Cape Horn. Classified. 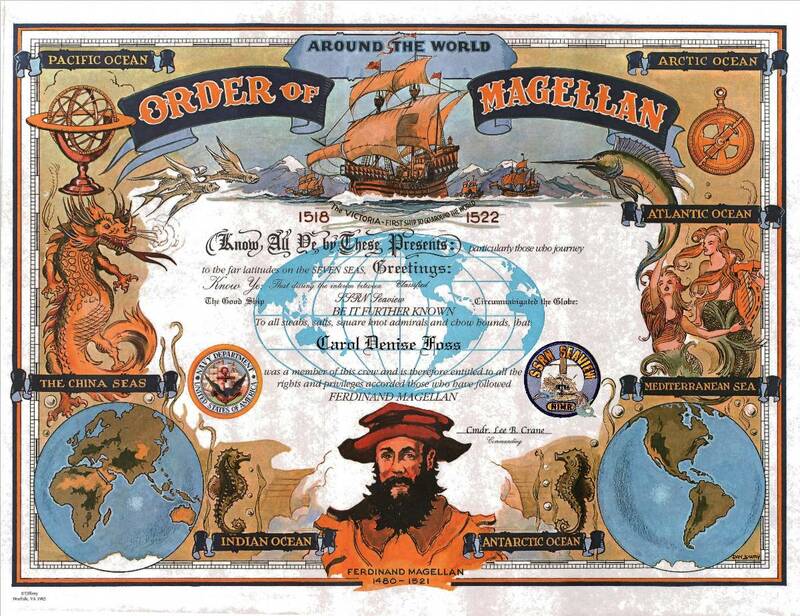 Order of Magellan Circumnavigating the globe. 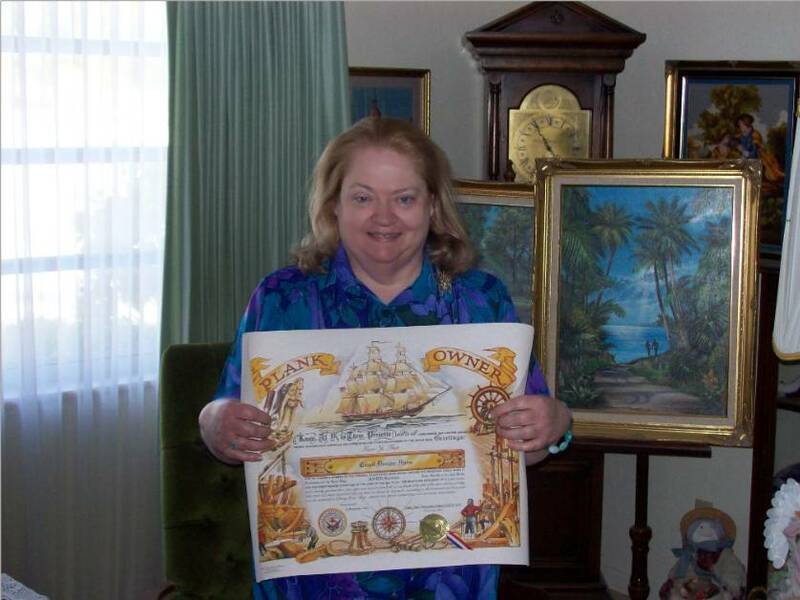 Certainly we shared in Seaview's vast geographical knowledge as she sailed the seven seas. No doubt she one or two missions non stop from one side of the world to the other. 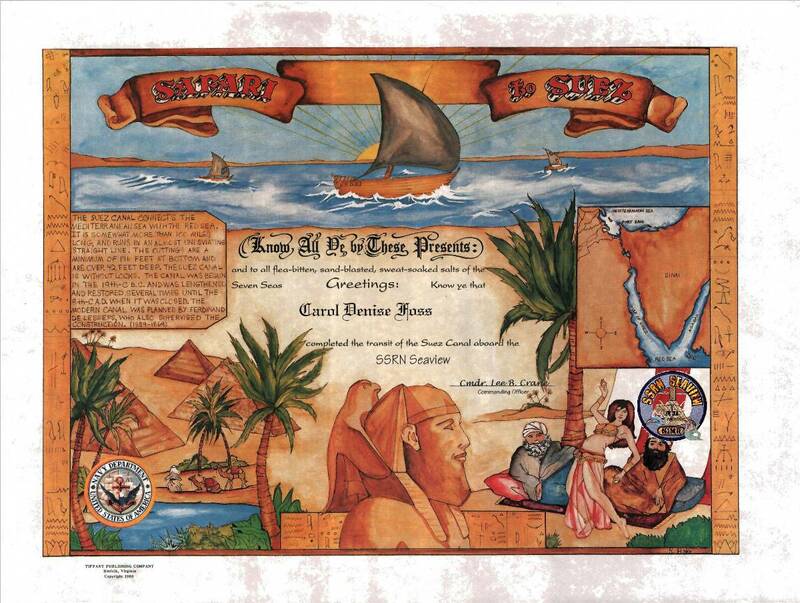 Order of the Ditch Going through the Panama Canal. A bit tricky for a sub of Seaview's size, but no doubt Nelson authorized it as a time saver for a grumpy Captain and crew. Of course, funds for transit though the canal probably bankrupted the party and paint fund. The Captain is still waiting for the Flying Sub's change from yellow to red. We hope he considered the shortcut worth it. 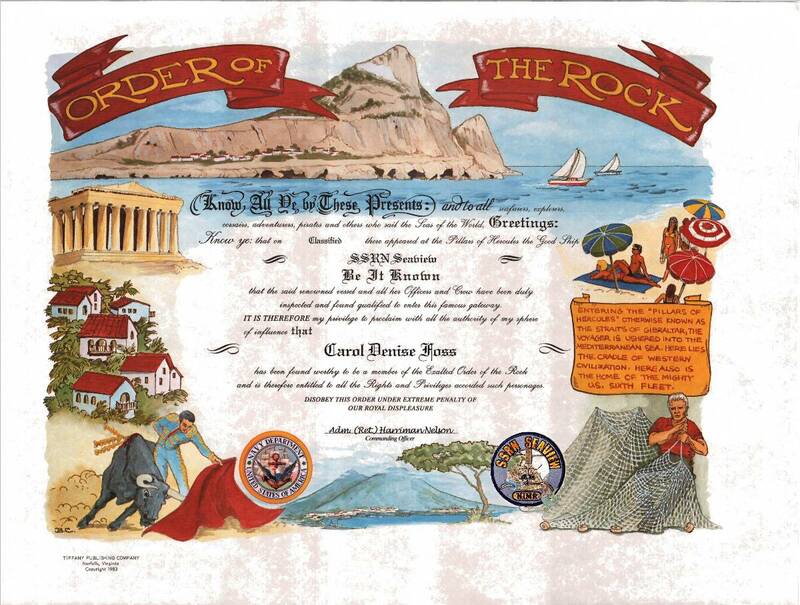 Order of the Rock Crossing through the Straights of Gibraltar. Definitely a designation Crane earned prior to service aboard Seaview as he was well aquainted with these waters. Order of the Square Rigger Service aboard any sqare rigger ship. Technically no one aboard Seaview has this designation, however in the interest of fair play Shamus O'Hara Nelson, Lt. Cmdr. Van Wyk, and Captain Edward Teach would be entitled to this designation during their time aboard Seaview. Persian Excursion Any service in the Persian Gulf. Safari to Suez Transit through the Suez Canal. Spanish Main Traversing the Caribbean. Hoist the Jolly Roger please. Whale Bangers Certificate issued to crewmembers who accidentally fire at a while, while mistaking it for a submarine. Yes, there is such a thing. Not used in reverse, such as Seaview firing on a whale hungry for a snack in the Diving Bell, however. 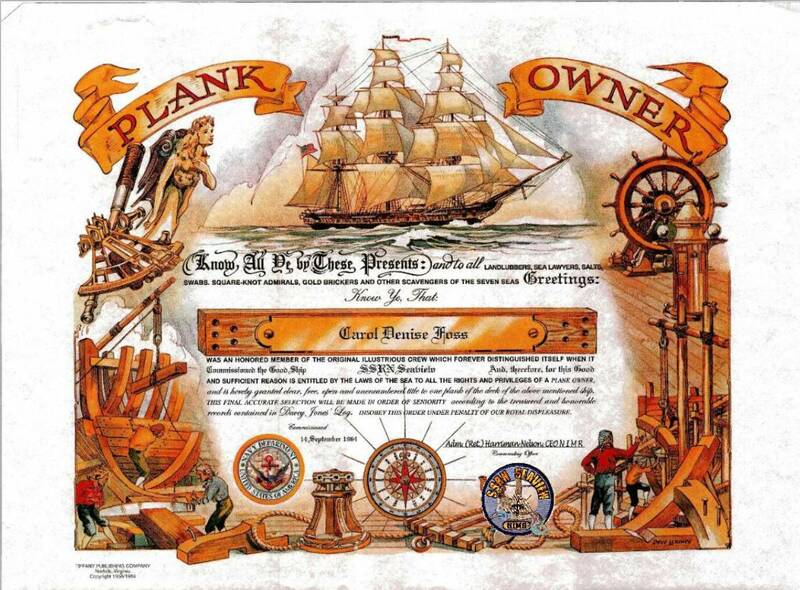 Plank Owner Certificate issued to Officers, crew, and Shore Command for the vessel's commissioning. Admiral Nelson definitely, possibly some of the other officers and crew. Captain Crane definitely not. However his alter ego David Hedison is entitled to the certificate,as are all fans who enjoyed Voyage to the Bottom of the Sea* (The series), during it's first airing.